With These Hands Returns to the Stage in August! The Heritage Alliance and The McKinney Center at Booker T. Washington School are joining together to produce the original, history based play, With These Hands. This full length “dramadey” will be a joint fundraiser for the Heritage Alliance and the McKinney Center. For the low cost of $20.00 per ticket, you will be supporting the educational programs of both organizations. Written by Anne G’Fellers-Mason and directed by Jules Corriere, With These Hands highlights significant moments in the history of Jonesborough and Washington County. It also features some of Jonesborough’s best known residents, including town historians Paul Fink and Miriam Fink-Dulaney. These are the stories of real people and real families through history. Can two families keep their friendship intact even though they find themselves on opposing sides of the Civil War? What is historic spit and what does it have to do with the Washington County Courthouse? Can a former, Southern Belle accept help from a Freedman? Hear these stories and more as the past, including archival photos from the Heritage Alliance archives, comes to life at the McKinney Center. Performances for With These Hands will take place at 7:30 p.m. on August 3rd and 4th. There will be a 2:00 p.m. matinee performance on August 4th. Tickets are $20.00 and proceeds benefit both the Heritage Alliance and the McKinney Center. Tickets may be purchased in advance and at the door of the show, depending upon availability. To purchase tickets, please call the Jonesborough Visitor’s Center at 423.753.1010. Tickets can also be purchased online at jonesborough.com/tickets. The Heritage Alliance of Northeast Tennessee and Southwest Virginia is dedicated to the preservation of the architectural, historical, and cultural heritage of our region and to providing educational experiences related to history and heritage for a wide range of audiences. The McKinney Center at Booker T. Washington School is dedicated to building community and enriching relationships through excellent arts education, cultural interpretation, and historic preservation. 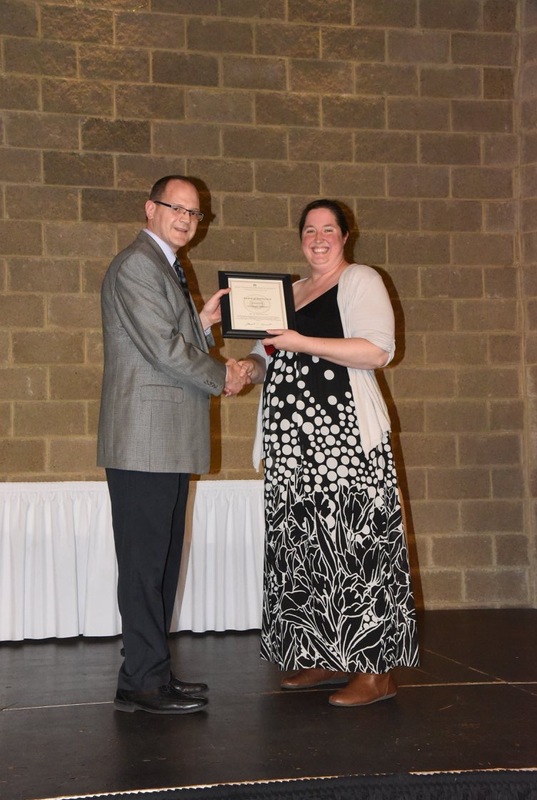 The Heritage Alliance and the Chester Inn State Historic Site and Museum received two Awards of Distinction from the East Tennessee Historical Society at their Annual Meeting on May 1 in Knoxville. 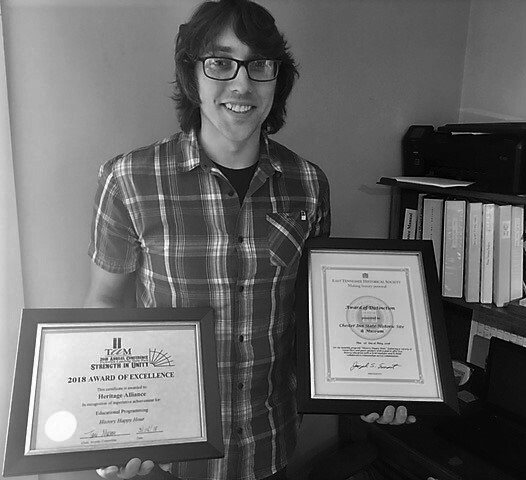 The East Tennessee Historical Society’s Awards of Excellence program annually recognizes individuals and organizations for significant contributions to the preservation, promotion, and interpretation of the region’s history. 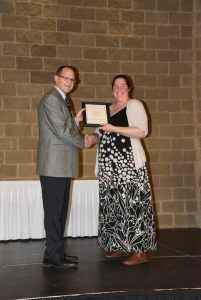 The Heritage Alliance won a 2018 Award of Distinction for the interactive, murder mystery Legs In a Barrel. The play, which was based on an actual murder that took place in Jonesborough, was a fundraiser for the Heritage Alliance’s educational programs. 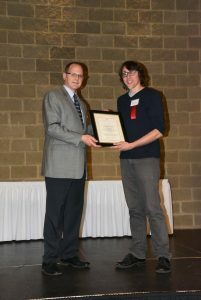 Legs In a Barrel was the first murder mystery put on by the Alliance, and it is another example of the organization’s commitment to sharing history in a variety of ways. The Chester Inn Museum received a 2018 Award of Distinction for History Happy Hour. Launched in 2017, History Happy Hour offers insightful history to the public, fosters a collaborative relationship with various individuals and organizations, and increases the role of the Chester Inn State Historic Site and Museum as a community meeting place. History Happy Hours are scheduled for the third Thursday of every month through November at 6:30. The Heritage Alliance is always working on new and exciting programs. Interested public can stay up to date on Heritage Alliance programs by visiting our website (www.heritageall.org) and liking us on Facebook! The Heritage Alliance is dedicated to the preservation of the architectural, historical, and cultural heritage of our region and to providing educational experiences related to history and heritage for a wide range of audiences. The Chester Inn Museum is a State Owned Historic Site operated by the Heritage Alliance. The operation of the Chester Inn is partially funded under an agreement with the Tennessee Department of Environment and Conservation and the Tennessee Historical Commission. For more information, please call our office at 423.753.9580, or contact the organization via email at info@heritageall.org. Additional information can also be found online at http://www.heritageall.org/. The weather is finally warmer, and that means extended tour hours and extended hours at the Chester Inn State Historic Site and Museum! 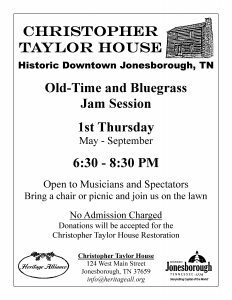 The Heritage Alliance, in cooperation with the Town of Jonesborough, will be hosting an old time and bluegrass jam session on the first Thursday of every month from 6:30-8:00. The first one will take place on Thursday, May 3. 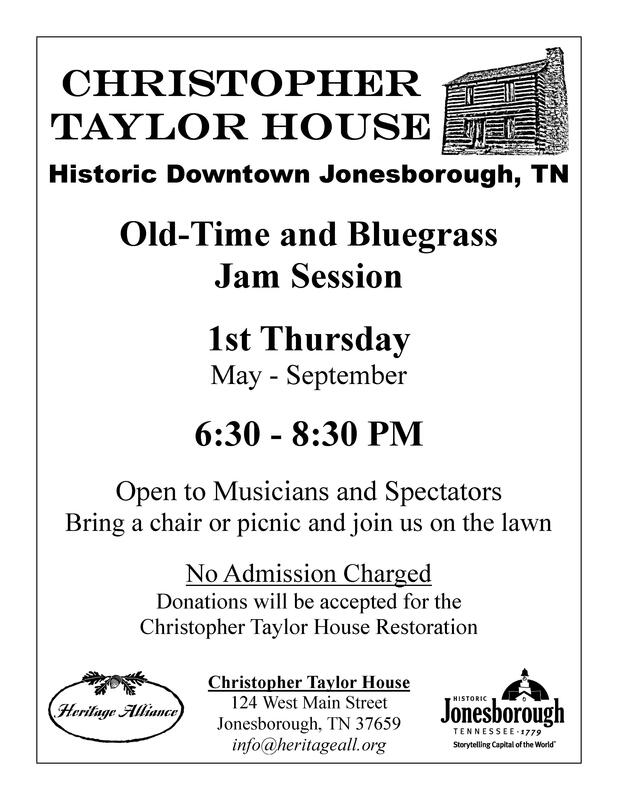 Bring your instrument, your chair, and a picnic dinner and come on down to the Christopher Taylor House on Main Street. This is a low key event, and it’s open to musicians and spectators. Jam sessions will take place from May through September. The Christopher Taylor House is located at 124 West Main Street next to the Chester Inn State Historic Site and Museum.